Then, participants will investigate the transition from a gas to a plasma and correlate the breakdown voltage to the length of the tube and the gas pressure (Paschen’s Law). We compare our experimental measurements to the ideal curve and use that to discuss sources of error in this multivariable system. To start the dc glow, air, argon, helium, or another gas filling the gap between the electrodes, must become conductive. The voltage applied by the high voltage power supply and hence the electric field in the gap, must be high enough to initiate electrical breakdown in the gap. 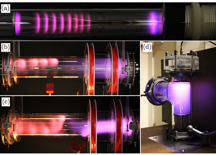 In such a breakdown experiment, participants measure the starting potential needed to initiate a continuous, self-sustained flow of current through the dc glow tube. Participants will experimentally investigate the dependence of the breakdown or starting voltage as the balance between electron production and loss changes. Increasing d decreases the electric field strength, and decreasing p increases the electron mean free path.